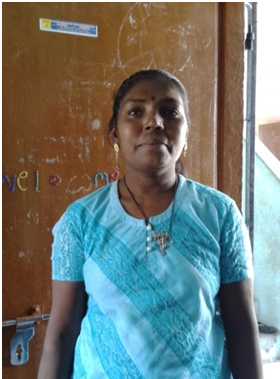 30 years old Ms. Ranjan Solanki is a resident of Kosad area of Surat and is a member of Saath’s Youth Force initiative. She has taken micro entrepreneurship through the programme and now earns Rs. 3,500 per month. Ranjan used to live in Ashoknagar, Katargam area of Surat, where she and her husband ran a grain shop. They were very happy in the area and their business was running good. When the Surat Municipal Corporation decided to demolish their slum area, they were promised to give new house in other area. After the demolition they were provided a house in the Kosad area which is at quite far from the city centre. Due to this Ranjan and her husband lost their business, and Ranjan was left with a lot of other issues as well due to shifting in the outskirts of the city. The main issue faced was of livelihood. They had lost their business and did not know what to do. The financial problems also started as they were using up their savings very fast. During this time Ranjan came to know about a micro entrepreneur training organised by Youth Force and she was advised to join the training. At that time she was not sure about the joining the training but Shital the youth leader convinced her by explaining the importance of training for her future. She spoke with her husband about the training and he said to her to join the training program. The training program lasted for 4 days and she was very happy with the knowledge she gained during the sessions. She got an idea to start a new business. Before the training she used to work in hospitals and in the houses but wans’t able to earn enough money. Now she has started her own venture and she sells vegetables and is able to earn Rs. 3,500 per month. She is now in a better position to support her family.